1. Heat a suitable pan over a medium heat; add 2 tbsp of vegetable oil and sauté the onion until golden, approx 5 minutes. If you have a Crock-Pot Sauté slow cooker, use the pot to sauté your onions. 2. Add the ginger, garlic and chilli and cook for a further 30 seconds. 3. Reduce the heat, add the spices, stir well and continue sautéing for a further 2 minutes. 4. Spoon the mixture into the removable Crock-Pot bowl. 5. Add the puree, tomatoes, lentils, stock, and squash, mix well, cover with the lid and cook on High for 3-4 hours or low for 5-6 hours. 6. To finish, stir in the lime juice and zest, spinach leaves and coriander. Serve with a dollop of natural yoghurt and some warmed flatbreads. 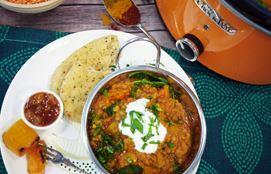 The perfect way to spice up your menu, this Crock-Pot Slow Cooked Vegetarian Indian-Spiced Squash And Lentil Curry is sure to be a favourite around the dinner table. Packed full of healthy vegetables and wholesome pulses, this hearty curry brings together a host of store cupboard and refrigerator essentials in order to create a magnificent Asian-inspired dish that wouldn’t look (or taste!) out of place in your local Indian restaurant. With hints of ginger, garlic, chilli, cumin, coriander, and turmeric, this flavoursome dish is tasty and filling, with just the right amount of spice. Of course, if you want to turn the curry up a notch, you can always add extra chilli. And this curried dish doesn’t only taste great, it’s also incredibly easy to make! Simply prepare all of the ingredients as per the recipe below, leave to cook for 3-4 hours on high, or 5-6 hours on low. It’s as easy as that! For a hearty, spiced supper, serve with a dollop of natural yoghurt and some fresh, warmed flatbreads. Or, to feed larger appetites, why not introduce a serving of boiled rice, chupatis, or even a selection of Indian side dishes?